Freestanding machine embroidery designs have been cleverly created to give lacy openwork patterns that do not require fabric and can be used in a variety of ways. Freestanding machine embroidery patterns, (also known as freestanding lace) offer the machine embroiderer the opportunity to get especially creative. As well as providing beautiful lacy patterns and designs, which can be used to create luxury lace edgings or inserts, free-standing lace designs will work well if embroidered onto water-soluble stabilizer without fabric. When the designs are finished, the light lace pattern allows light to shine through the open work, making this a useful adornment for a variety of projects. Freestanding machine embroidery patterns have been cleverly created so that the stitches overlock and hold together. 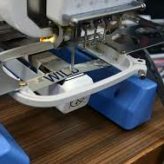 This is extremely important as this ensures that when the lace design is worked on the water-soluble stabilizer, the stitching does not unravel. The designs are stitched out in the hoop and then gently soaked in warm water until the water-soluble stabilizer dissolves and starts to disappear. This might entail a little gentle scrubbing to remove any residual stabilizer. The design should be laid flat to dry. If it curls slightly after drying, then it will benefit from lightly ironing (iron on the rear side and use steam if necessary). There are many freestanding lace designs available, and these can be used to make doilies and coasters, lace tray covers and also large items such as tablecloths. Small motifs can be used for jewelry. Delicate lace designs can make a striking collar. Freestanding lace can also be used for ‘in the hoop’ projects. An ‘in the hoop’ project is a project which is entirely stitches within the hoop of an embroidery machine. These often include little lace boxes, bowls, bookmarks and even purses. 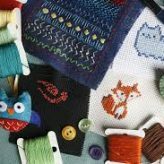 These are great projects for making something a little special and for exploring in more detail the opportunities that your embroidery machine brings. Freestanding machine embroidery patterns can also be used to make interesting seasonal decorations. These include Valentine hearts, Easter bunnies and eggs, Halloween pumpkins and ghosts, and of course Christmas decorations. These patterns are stitched out in the hoop, and then when the water-soluble stabilizer has been removed, they are ready to hang and enjoy. There are many designs available. Some designers offer some free designs to allow you to try this technique before purchasing designs. Have fun and experiment with freestanding lace. It brings a new dimension to your embroidery and allows plenty of scope for further creativity. The art of monogramming has been around for centuries, and today"s use is as much about personal expression as it is about identification. It is a popular design element for wedding decorations, for personal stationary, and for jazzing up plain towels. It can be super traditional or have a little modern edge. Its design possibilities and potential use are limited only by your imagination. It is the monogram, and it is all yours. Here’s a look at facts and tidbits about your favorite way to personalize items. Greeks and Romans used monograms to identify rulers on their coins. In the Middle Ages, artists and artisans adapted the monogram as a way to sign and identify their work. During the Victorian Period, high-class folks used monograms liberally as a way to symbolize their place in society. Who can forget Laverne of the hit television show Laverne & Shirley, who proudly displayed her single-letter monogram on her shirts and sweaters? In recent years, the trend has resurfaced not only on Laverne-style sweaters, but also with three-letter monograms on bags, personal stationary, and baby items. With the swelling popularity of using monograms and the special cases that arise when combining names, traditional monogramming etiquette is not quite as prevalent or required, today as it has been in the past. However, it can be helpful to keep in mind certain rules of monogramming before applying, or creating, your own. The most common format is three letters representing the first, last, and middle names. The last name initial goes in the center and is in larger type. 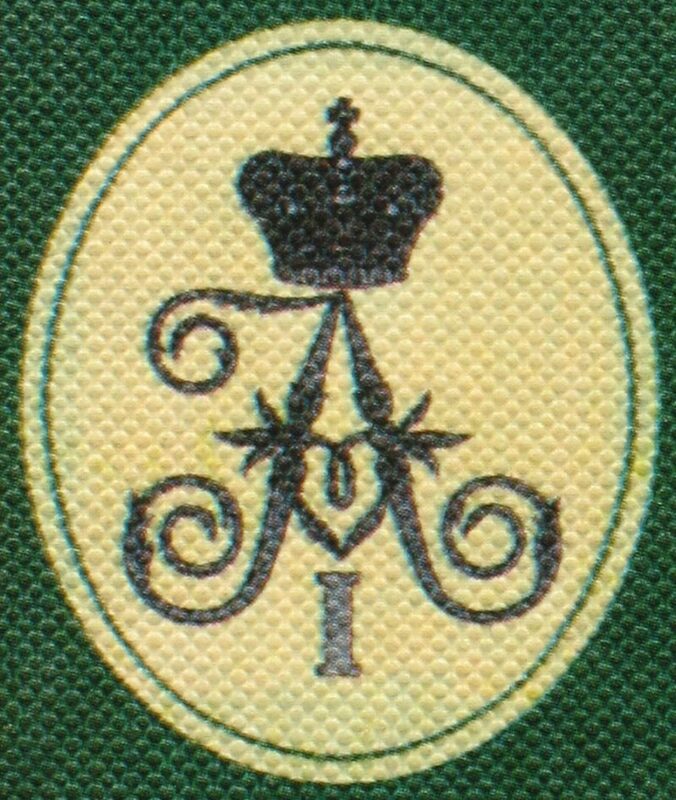 For example, the monogram for Sara Ellen Taylor would read: S T E.
For monograms printed in order of first, middle, and last name, the initials should be printed in the same size like this: SET. Of course, these are just examples of traditional monogramming techniques. Many circumstances today require other monogramming formats, which is part of the fun. You get to create a look that is uniquely yours. 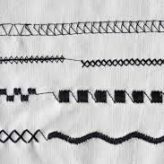 While some cross-stitchers prefer to use an embroidery stretcher frame or hoop, others use nothing. To find out what goes well for you, try different tools and methods. 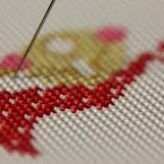 The tools and methods being used to cross stitching are different. Remember this; what works for one stitcher, may not work for another one. Stabbing method – Used frequently by beginners. The stabbing method is done by stabbing the needle in front of the cross stitch fabric and then pulling it through the different side, working in a row of half-stitches (/////), and then back (\\\\\\) to complete your Xs. If you prefer this method, it’s best to use a frame or hoop. Also, the stabbing method is a good choice when working vertical rows of stitchers. Sewing method – The sewing method is only making each completed X at a time. It’s a better alternative if your colors are scattered. If you prefer to not to use a hoop or any other device that secures your fabric, then the stitching method works well. But if you’re a new stitcher, then it’s best not to use this way to stitch as the fabric can be twisted by the altering movement of your hands. An advantage is that you’re able to sew at a somewhat faster rate than the stabbing method. Regardless of which approach you select, just always keep your Xs in the same direction. This means that the top thread of the X should slant in the similar direction, whether it’s (/) or (\). Lay your stitches as flat as tin soldiers so they will not appear distorted. That depends on what you’re stitching as well as what best suits you. There are various options which include hoops, embroider stretcher frames and Q-Snaps. Embroidery Hoops – Hoops are advised when doing most other forms of embroidery to maintain an even tension in your stitches. 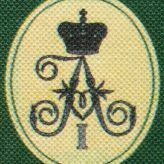 But, for stitching on Aida fabric, it’s not advisable because it can be hard to remove hoop marks. If you use a hoop, don’t hold the tension too tight, remembering to remove it before when you finish a stitching session. When you are working with linen, the lines come out easily when your fabric is stretched. Stretching Frames – These come in an assortment of lengths and widths. Buy stretcher bars about an inch (or smaller) than your fabric size, leaving you to attach fabric to the outer support of the stretcher bars. When using stretcher frames, be sure to keep a uniform tension while sewing. Q-Snaps – Most stitchers prefer this. Q-Snaps are plastic clamps that snap synchronically around your fabric creating a frame for stitching. They come in an assortment of sizes that you can mix and match. To secure extra cloth that can get in the way while stitcher, a hair clam works well. Many stitchers prefer to stitch holding their fabric “in hand”, not to using any hoop or stretcher frame. Most often, sewing in hand is preferred when stitching on linen. Hold your cloth (with the right side on the inner side) to get to your stitching space. This protects the rolled edges from blemishes while stitching. Stitching in hand is a great method if you have right tension. However, if you notice your stitches are puckering the fabric, then perhaps some kind of frame, hoop, or scroll rods would be better. Also, if you see your stitchers are opening up “holes” at the corners, it’s better to use a stretcher frame or hoop. Experiment with all of these materials and methods to find out what works well for you. After all, cross stitching is a hobby that’s meant to relax yourself, so you need to be as comfortable as possible. 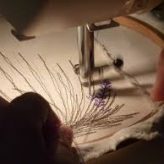 With the right hooping and stabilizing techniques and the right design choice for a particular fabric, even a novice can achieve professional embroidery results. Although machine embroidery appears fairly straightforward – the machine does most of the work – it is important to realize that proper hooping and stabilizing, and proper design choice are necessary to achieve professional-looking results on any fabric. Many embroiderers forget that some designs work better than others on certain types of fabric. This can be particularly troublesome when doing custom embroidery for a client who has a specific idea in mind. Still, choosing an appropriate design for the fabric and application can make a huge difference in the quality of the finished project. As a general rule, lighter-weight fabrics and fabrics that need to drape require lighter, more open designs to avoid drooping and puckering. Fabrics with a high nap, like thick towels, require more dense designs so that the stitches don"t get lost in the fabric. Sturdier fabrics and projects that don"t require the fabric to drape offer more flexibility about design choice. The many varieties of stabilizer can be intimidating at first, but each has a purpose. Weaker fabrics require a sturdier stabilizer. The lightweight water soluble stabilizer is used as a “topper" on fleece, terry, and other high-nap fabrics. The water-soluble topper helps the stitches sit easily on top of the nap and keeps individual threads and loops from poking through the embroidery. The heavyweight water soluble stabilizer is used for freestanding lace, translucent fabrics (like organza), and projects where the back of the embroidery will also be visible. In these cases, it is essential that no stabilizer show at all. Tearaway stabilizer is available in light, medium, and heavyweights. Tearaway also comes in wet and stick and peel and stick varieties. Woven fabrics with a light, open designs work well with tearaway stabilizer. Sticky stabilizers are good for very thick fabrics that are hard to hoop. When using a sticky stabilizer, it is important to clean the needle with alcohol if it starts to get sticky while sewing. Cutaway stabilizer comes in light, medium, and heavy weights as well as fusible (iron-on) varieties. Cutaway stabilizers are good for knit fabrics like stretchy t-shirts, thin fabrics or fabrics with a loose weave, and for more dense designs on woven fabrics. Cutaway stabilizer is very sturdy and helps the design keep its shape even through repeated washing and use. Hooping the fabric properly may be one of the hardest skills for new embroiderers to master. Many embroiderers like to hoop sticky stabilizer and then adhere the fabric to the stabilizer without actually hooping the fabric. This is a shortcut and in some cases (very thick fabrics that can"t be hooped) it is necessary, but for the best results, fabric and stabilizer should be hooped together. Even on low-end home embroidery machines, the needle may puncture the fabric ten times per second or more. This causes tremendous strain on the fabric and may lead to the fabric shifting or stretching during embroidery. When the stabilizer and fabric are hooped together, stretching and shifting are minimized and all stitches land where they are supposed to. Ironically, thicker fabrics like bath towels and sweatshirts are the most difficult to hoop, but these same fabrics need to be hooped the most. When using a sticky stabilizer on very thick fabric, the bottom of the fabric will be held in place by the stabilizer, but the top of the fabric may still shift causing parts of the design not to line up properly. For the best results on most fabrics, use a sticky stabilizer, a fusible stabilizer, or spray the stabilizer with temporary adhesive and attach to the fabric. Open the top hoop wide enough to accommodate the fabric and stabilizer together. Place the bottom hoop on a non-slip surface (rubber shelf liner is inexpensive and works well for this purpose). Place the fabric/stabilizer combo on top of the bottom hoop. Place the top hoop on top and slide the fabric as necessary to align the horizontal and vertical axes with the hoop. Firmly press the top hoop into place without stretching the fabric. Tighten the top hoop as much as possible. The fabric should be taut and sound like a drum when thumped. Never try to stretch or shift the fabric after it is hooped. If there are loose spots, remove the top hoop and start over. For slippery fabrics like nylon, place small strips of rubber shelf liner or double-sided tape around the sides (not the corners) of the bottom hoop before hooping the fabric. This will keep the fabric from slipping during embroidery. Using the right needle is almost as important as using the right stabilizer. For most fabrics, a medium-sized (75/11 or 90/14) embroidery, universal, or sharp needle will work well. More delicate fabrics require a smaller needle. For stretchy fabrics, always use a ball-point needle to avoid runs in the fabric around the design. For specialty applications like leather and denim, use a special needle that is designed for that purpose. There are also special needles for thicker threads and metallic threads that will minimize thread breakage and shredding. Embroidery is a wonderful way to personalize just about anything and can be a most rewarding hobby. Mastering techniques like proper hooping and stabilizing, knowing the characteristics of the specific fabric and making wise choices about designs, stabilizer, and needles can make the difference between a headache, heartbreak, and overwhelming pride.